Downeast Brass band will play a benefit concert Thursday. WINDSOR — Efforts are underway to raise money for a veterans’ memorial listing the names of Windsor residents who served in any of the nation’s wars and conflicts. The project is in its early stages, but organizers said they want to raise money to build a bigger, broader monument to Windsor residents who served. It would be placed at the town’s existing memorial to veterans, at the corner of Ridge and Reed roads, across Reed Road from Oak Hill Cemetery in front of Windsor Christian Fellowship Church. Currently that roadside memorial has a flag pole, landscaping and two memorial stones, one dedicated in 1992 stating “Proudly we pay tribute to all those who serve in all wars and conflicts,” and another, older stone with a plaque listing the names of Windsor residents who served in World Wars I and II. 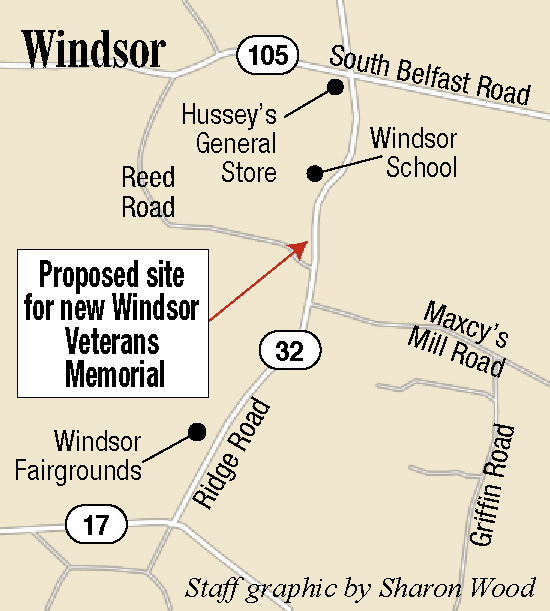 The proposed new Windsor Veterans Memorial would be larger and list the names of residents who served in any of the nation’s wars and conflicts. Perry said the memorial will include paving stones which people could, for a fee that would go toward the cost of the memorial, have inscribed and dedicated in honor of a loved one. Perry said she doesn’t yet know how much the proposed new memorial would cost or what its final design would be, as the effort to add to the memorial is still in its early stages. She said the general idea is to have a monument similar to ones created in the towns of Farmingdale and Randolph, which list the names of residents from those towns who served in the military during wars and conflicts. Despite just starting recently, the group has already raised just under $1,000 from donations, a beano benefit event at the Windsor Fair and from the sale of hanging flower baskets that hung on the fairgrounds. The baskets were donated to the Windsor Veterans Memorial Committee to be sold to raise money for the memorial. Donations can be dropped off at the town office, where they will go into a special account for the memorial. Anyone with questions or wanting to help raise money may also reach Perry through the town office. A benefit concert by Downeast Brass is planned for the memorial fund at 7 p.m. Thursday, upstairs at Windsor Town Hall. The concert is free but attendees are asked to make a donation at the door for the memorial. Perry said she and other committee members are very grateful the band members agreed to play at no charge, donating their time and talents for the cause. Refreshments, provided by Windsor Ladies Aide, will also be available at the concert.